The BDO board have also issued a promotion for all counties wherein FREE Tickets are available for spectators should they wish to attend. This would be for the weekday afternoon sessions but a must is that if you apply for and receive tickets, you must attend or you will end up paying in full as a result. A major announcement has been released from the BDO regarding the removal of restrictions placed upon PDC tour card members playing within the BDO system. A big day for the BDO today as we welcome a new board and new chairman onto the committee. Des Jacklin was successful in his bid for the role and now is your BDO Chairman. A new era is upon us and assurances have been made to improve, correct and push the BDO forward. At present full details of Des’ plan haven’t been announced but as a county we need to support the board, work together and look toward a new outlook. Patience will be required during a massive changeover from the outgoing board. A special thankyou to Sue, Wayne and John Weller for all they have done over the past years. Also commiserations to Roger Schena in a closely contested vote against Des. I’m sure Roger will continue in his own goals within darts and I’m sure good things will come from his team. Thankyou to all those that entered and participated in the Cheshire Open this year. Another fantastic event with a strong line up of competition players. Results from the Cheshire Open can be found on the Cheshire Open 2018 page. A big thankyou to all that helped with the running of the weekend and to all those behind the scenes that help to make the weekend as successful as it was. http://www.dartsforwin.com/live/ - Live Scoring for Cheshire County Games, click link and find most recent Cheshire vs link. Following the recent introduction of the new GDPR EU regulations, the BDO has issued a new version of Superleague Registration form along with a new County Registration form. These new forms are to be used with immediate effect and please also note the information supplied by the BDO to inform members of how their data is recorded and used. All Cheshire Open Entries to be sent to – Mrs Lyn Marsden. Shotwick Lodge Farm, Lodge Lane, Saughall, Chester. CH1 6JL. Cheques made payable to 'CHESHIRE DARTS ORGANISATION' please. Venue will be open from 9am both days. Minimal parking is available at the Venue. Venue is family friendly and will have a kitchen in operation, please DO NOT bring your own drinks onto the premises, if caught you will be asked to leave. 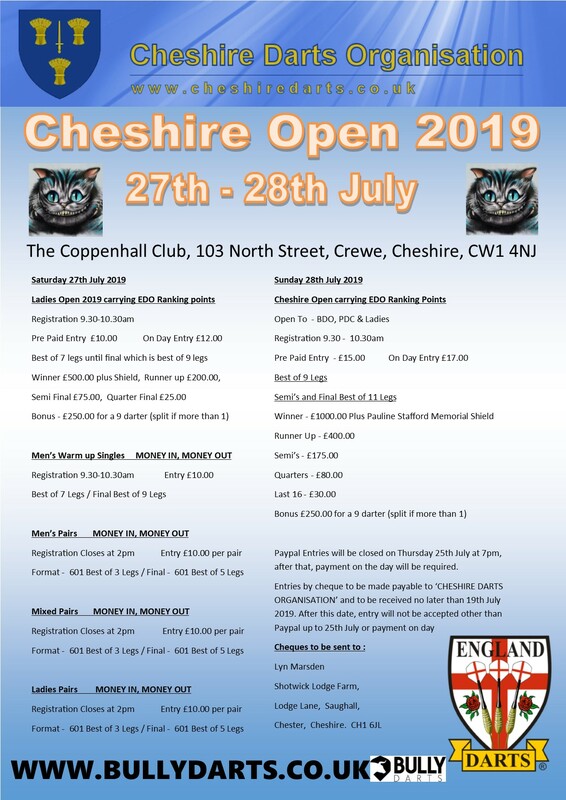 Entries can also be done online, please visit 'www.cheshiredarts.co.uk' and follow the link for CHESHIRE OPEN 2018, entries can be done online and paid via PayPal. Pre-Entries will close on the 18th July, after this only ON DAY rates will apply. 13 Match Boards will be available on both days. Well done to the Temple Bar Ladies in coming Runner's Up in the Champions Of Champions! The Cheshire Ladies Team consisted of 7 players, with Captain Carole Flewitt, Jane Densley, Anastasia Dobromyslova, Dawn Williams, Lyn Marsden, Loll Abley, Sally Evans & Rach Bird, along with support from team mates Lainey Webb, Helen Graham and young Aimie. Our Ladies topped their group with ease to then overcome Yorkshire 4-1 in the Quarter Finals. Merseyside Ladies were their next challenge in the Semi's, who they beat 4-1, before falling short to Lancashire in the Final, coming down to the last leg of the day! So close for our Ladies, who continued their remarkable form for Cheshire from the Rudheath Ladies, making it a Semi's, Final and Winners in the last 3 years! Our Men's unfortunately drew the group of death for a 2nd season running, with Yorkshire and Lincolnshire both in our group! Our only loss came to the hands of Yorkshire 7-2, who went on the win the event 9-0 in the Final. The Temple Bar Men's Team consisted of Captain Daniel Smithers, Bryn Suckley, David Bird, David Smith-Hayes, Michael Haynes, Paul Bettney, Mark Graham, Mal Barrow, Gaz Owen, Shaun Walshe, Neil Gilmartin & Matt Hunt. A big thank you to Tony Martin and the ladies for their support. The Gold Cup played on the 1st July wasn't so successful for Cheshire. Unfortunately our Pairs Tony Martin/David Bird, Danny Ayres/Paul Goodwin fell in the first round with Anastasia Dobromyslova/Jane Densley falling in the 2nd round, with the only good run in the Singles coming from Anastasia Dobromyslova, who fell in the Quarter Finals to Fallon Sherrock 4-2. Fallon continued and went on to win the Singles and Pairs with her sister Falicia Blay. Well done to all who represented Cheshire this weekend, you all did your County proud, kick on for the new season and here's to next year! Congratulations to Cheshire's Carl Dennel who won through the World Darts Trophy Qualifiers in Prestatyn at the Welsh Open. Carl will now go through to the finals in Barry, South Wales, to compete in the Men's Singles whilst Anastasia Dobromyslova will be battling for another title in the Ladies Singles. Carl Dennel will be playing on Firday 26th May against Welsh Legend and Gwynedd's Martin Phillips, whilst Anastasia will begin her title charge against Lincolnshire's Sue Edwards on Saturday 27th May. 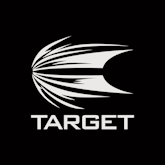 We wish both players the best of luck for the BDO World Darts Trophy. The Welsh Open also seen some good runs for our Cheshire Players. In the Men's Singles, Mark Graham made an excellent run to the Last 32, eventually falling to Gary Robson, whilst Mark's Daughter, Jess Graham, a Cheshire Super League and Clwyd Youth Player, got to the Semi'Finals of the Girls Event, one round off playing on the Main Stage. A great father and daughter moment, and I'm sure there'll be many more to come! In the Ladies Singles, Anastasia Dobromyslova made an impressive run to the Quarter Finals in her first ranking event back since becoming a Mother. Anastasia eventually fell to Yorkshire's Lorraine Winstanley, who went on to win the Ladies Singles against Lisa Ashton in the Final. Jane Stubbs and Mandy Smith also made the last 32 of the Ladies Singles. Jane fell to Anastasia, whilst Mandy Smith fell to Lorraine Winstanley in a close encounter, ending 3-2 to the Yorkshire Ace. Well done to all of our Cheshire Players over the Welsh Open Weekend and long my your form continue. Cheshire Darts Organisation would like to congratulate Tony O'Shea on being re-selected for the England National Team!! Tony unfortunately lost his place a few years ago, but has bounced back in style to re-claim his place. This will give Tony the opportunity to build on his 74 caps for his Country, still the 2nd most capped player of all time behind Cambridgeshire's Martin Adams, who also re-claimed his place in the team. Also, former Cheshire Star Lorraine Winstanley kept her place in the Ladies side as she continues her great form for Yorkshire. Cheshire would also like to mention some honourable mentions who we feel have performed outstanding this last year, and urge these players to continue and let their talent shine to possibly challenge next year - Michael Haynes, Patrick Lynskey, Jane Densley & David Smith-Hayes for Wales. MICK HAYNES GWYNEDD OPEN CHAMPION 2017!! Well done to Cheshire's Michael 'Mick' Haynes on winning the Gwynedd Open 2017, beating Derek 'Nod' Williams of Clwyd 5-4. Mick picked up £1,200.00 winnings aswell as a Lakeside & Winmau Qualifiers spot for later on in the year! A great achievement from the Cheshire Ace and we hope he continues his great form up! This year's Lakeside will see 2 current Cheshire Squad Players battling it out to be crowned Lakeside World Darts Champion. 3 x World Champion Anastasia Dobromyslova will be looking for her 4th World Title, hopefully with help from baby bump, which we'd like to congratulate Ana and Tony Martin on, from all in Cheshire. Ana has continued to play at a remarkable standard and boasts major experience in the World of Darts, as she bids to become the first Ladies Players to lift the Trophy during pregnancy. In the Men's we'll see Tony 'Silverback' O'Shea, a former 3 x Finalist, attempting to win his first World Title. We're hoping to see the dominant Silverback roar to success this year. Although not a current Squad Player, we'd also like to wish Darryl 'Dazzler' Fitton the best of luck too. Darryl has spent many great years with Cheshire, a former Captain and phenomenal character. He'll always be in the hearts of Cheshire and supported. From all at Cheshire, we wish all 3 of you the best of luck!! Well Done to Darryl Fitton and Anastasia Dobromyslova on their runs to the Semi'Finals! Well done to the Temple Bar Men's and Rudheath Ladies on their efforts at the Champions of Champions at the Event City. The Temple Bar Men's encountered the group of death with Yorkshire, Clwyd & Oxfordshire, and didn't progress to the knock out stage with Yorkshire storming the group and eventually getting to the final. The Rudheath Ladies, defending Champions, had an awesome run to the Semi'Finals, eventually going out to Nottinghamshire, who then lost to Winners Cambridgeshire in the Final. Also, away from Event City, well done to Anastasia Dobromyslova who made it to the Final of the Antwerp Open in Belguim, losing to eventual winner Lisa Ashton. Well done to Cheshire's Anastasia Dobromyslova on winning the Ladies European Classic in Blackpool on the 30th July. Anastasia beat her pairs partner from the tour, former Cheshire ace and current Yorkshire Captain Lorraine Winstanley 5-4. Mean while, Cheshire Men's A Captain Bryn Suckley reached his first BDO Major Semi Final in the Men's event. Bryn enjoyed some brilliant victories over Jamie Hughes, Brian Dawson & Shaun Carroll, all England Internationals, before beating Danny Noppert in the Quarters 4-3 from 3-0 down. Bryn eventually fell to Wesley Harms in the Semi's 5-2. On the 31st July, the second set of singles events was hosted, with Bryn Suckley completing a great weekend with a run to the Last 16, earning enough points to break into the BDO's top 70 in the rankings. Carl Dennel also fell at the Last 16 stage, with David Bird reaching the Last 32. An all round great weekend for Cheshire players, well done to all who played. The 2016 Cheshire Open was won this year by Nathan Aspinall as he overcame an all Stockport Final beating Steve Atkinson in the Final, in a field over over 100 entries. The Cheshire Open witnessed a magical moment from Nottinghamshire's Kyle Anderson who recorded a 9 Darter in his first round clash against Chris Clark. Anastasia Dobromyslova won a repeat of last years Final 5-3 against Lisa Ashton with both players average around the 80 mark. Anastasia only dropped her first leg in the Semi-Finals against Mandy Smith, losing 4 legs out of 25 during the day. GOLD CUP SINGLES CHAMPION FROM CHESHIRE WITH LOVE!!! A huge congratulations to Cheshire's Ladies Gold Cup Champion Anastasia Dobromyslova! Anastasia finally captured the Major Title that has slipped through her fingers over these last few years in a clinicle display against the Dark Destroyer Deta Hedman on the 2nd July, at the Manchester Event City! Anastasia over came Tricia Wright (Surrey) in the Quarter Finals before beating Clare Brookin (Cambs) in style 4-0 with a 29.04 Average in the Semi's. Anastasia then faced up against Deta (Oxford), who earlier won the Ladies Pairs Gold Cup Title, overcoming the final with a 5-2 victory with a 27.23 Average. A remarked day which also seen Anastasia reach the Semi's of the Pairs with Bev Martin, after they attempted to re-capture their title from 2014. Well done to all the Cheshire Players who went to represent their County in Manchester, (Bryn Suckley, Simon Arora, Mark Jodrill, Ross Guilder, David Smith-Hayes, David Bird, Paul Blythe & Shaun Walshe), you did your County proud and we look forward to next years Gold Cup already.